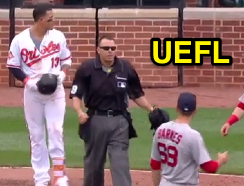 HP Umpire Andy Fletcher ejected Red Sox pitcher Matt Barnes (Throwing At Orioles 3B Manny Machado) in the bottom of the 8th inning of the Red Sox-Orioles game. With one out and one on (R2), batter Machado fouled a first-pitch changeup from pitcher Barnes. Replays indicate the pitch was located significantly inside and head-high (it was properly officiated as a foul ball, as the pitch indeed struck Machado's bat and did not make contact with his helmet), the call was irrecusable. * At the time of the ejection, the Red Sox were leading, 6-0. The Red Sox ultimately won the contest, 6-2. This is Andy Fletcher (49)'s first ejection of the 2017 MLB regular season. Andy Fletcher now has 2 points in the UEFL Standings (0 Previous + 2 MLB + 0 Irrecusable Call = 2). Crew Chief Hunter Wendelstedt now has 3 points in Crew Division (2 Previous + 1 Irrecusable Call = 3). *Related Ejection: Alan Porter/Brian Butterfield (Machado's slide injured BOS 2B Dustin Pedroia). This is the 13th ejection report of 2017. This is the 5th player ejection of 2017. Prior to ejection, Barnes' line was 1.1 IP, ER, SO. This is Boston's 2nd ejection of 2017, T-1st in the AL East (BOS, TB 2; BAL, NYY, TOR 0). This is Matt Barnes' first career MLB ejection. This is Andy Fletcher's first ejection since May 30, 2015 (Yunel Escobar; QOC = Y [Balls/Strikes]). Wrap: Boston Red Sox vs. Baltimore Orioles, 4/23/17 | Video via "Read More"